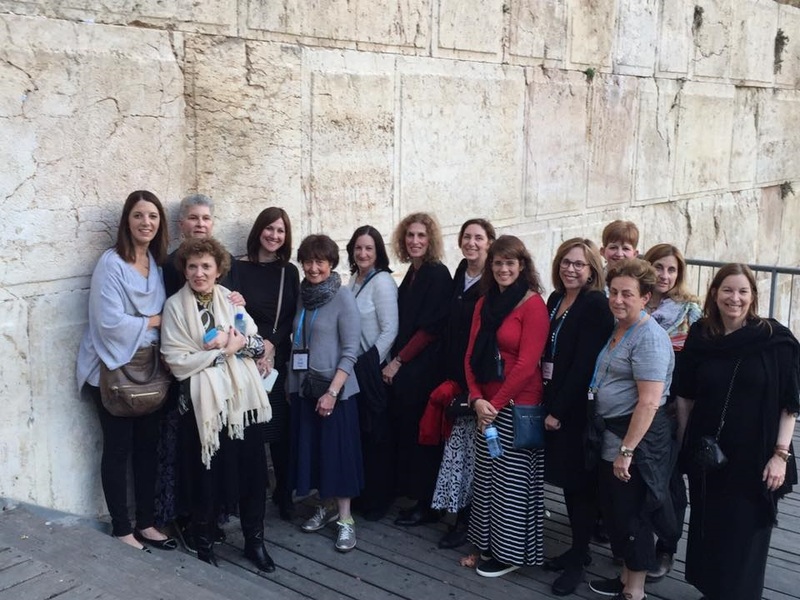 November 2016 marked the first-ever Jewish Women's Fund of Atlanta site visit trip to Israel. 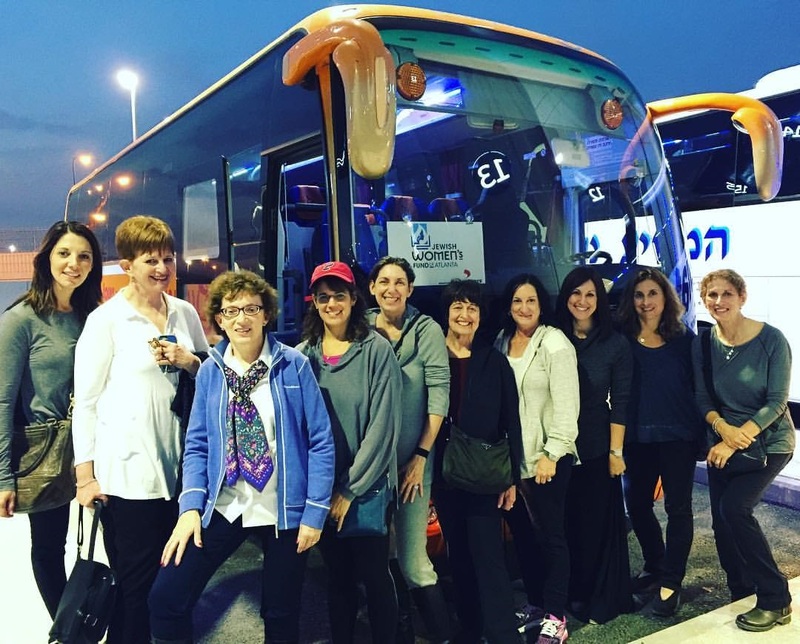 Please follow along with us on our adventures to meet our Grantee Partners and gain a better understanding of the social, political, economic, and legal landscape for women and girls in Israel. Visit our Facebook Page (www.facebook.com/jwfatlanta) or Instagram feed (@JWFAtlanta) for more photos! Amazingly, flight connections for those of us leaving Atlanta on November 9th worked like clockwork – one group flew from Atlanta to Tel Aviv via JFK and another from Atlanta to Tel Aviv via Paris – and our flights landed within 15 minutes of each other (about 4:30 in the afternoon). Lots of hugs and smiles! We were met by our gude Michal and boarded our bus to Jerusalem; within 45 minutes we were checking into rooms at the David Citadel hotel. After check in, and for some a shower and fresh change of clothes, we met for our first “official” dinner. Hungry – yes, although some of us had eaten every meal possible in every time zone from Atlanta to Israel! Tired – yes yes, but we kept ourselves going by pumping excitement through our veins. 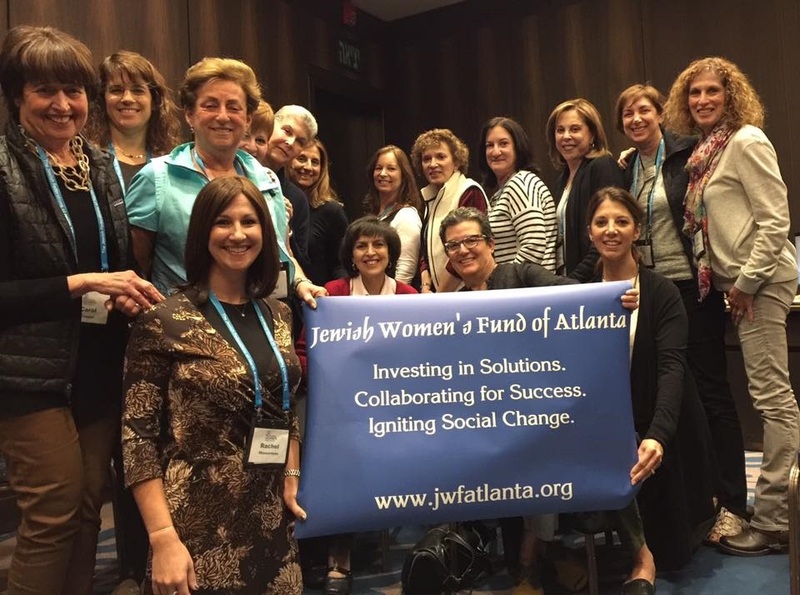 And thankful – yes yes yes, as we began to fulfill the dream of having a JWFA trip to Israel to meet with Grantee Partners. The first meal was incredibly delicious…and incredibly filling! After stuffing ourselves with appetizers of different Israeli salads, most of us would have been content to have been served dessert. But, there were many courses to savor in between. Our guide Michal and our Executive Director Rachel gave us an overview of what our time in Israel would be – meetings with Grantee Partners, the Dafna Fund (a feminist philanthropic effort based in Israel and part of our Jewish Women’s Funding Network), and potential grantees…and yes, small pockets of free time. With platters of dessert before us, most of us managed to ingest a few extra bites of carbohydrates as our eyes were drooping at the dinner table. Off to sleep – hopefully – so we could meet our first full day in Israel with energy and passion. Yes, JWFA was finally on the ground in Israel! Hamutal Gouri from the Dafna Fund spoke with us this morning. We learned about the two major issues affecting the progress of women in Israel. Those issues are the lack of separation between religion and government and the fact that Israel is a country in conflict and consumed by the military. Hamutal spoke about the value and strength of collaboration and spoke specifically about the Jewish Women’s Funding Network collaborative grant (more on that to come in the coming months and years). 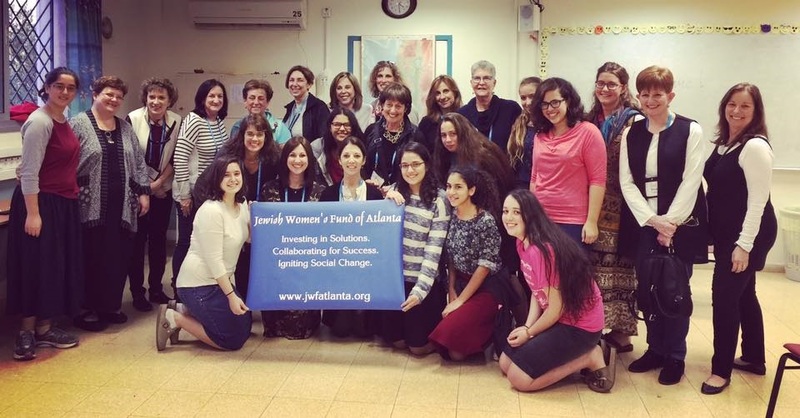 After discussions with all of the participating Jewish Women’s Funds, it was decided that the focus of the grant would be women in the workforce. We were graciously greeted at Eden Center Mikvah by Dr. Naomi Marmom Grumet, The Center’s Director, and one of her Mikvah attendants, Chaya. The Eden Center is not a current grantee partner, so we do wonder why we are going to the Mikvah. We are however, opened minded women, and team players, so we walk in with open eyes and ears. Naomi begins to tell us her story. It’s a story of a woman who grew up in the United States just like us. A story of a young woman who attended a university in United States, to focus on Jewish Studies. During her graduate years at Brandeis, she is challenged with finding the right kind of research projects related to Jewish women that really make sense to her. Is it baking challah? Is it lighting candles? She tells herself, these are all important things in life, but she wants to do more and find a way to make a major impact in the lives of Jewish women. That brought her to begin her quest to learn more about the meaning of Mikvah. One might think at this point we would be led around of Mikvah and leave quickly; after all, most of us know what a Mikvah is…or do we? Naomi began to open her heart up to us and share the most intimate details of what kind of hidden torment lies behind the walls of The Eden Center. She shares stories of women who need the Mikvah not just for a spiritual ceremonial ritual, but rather the Mikvah’s role in helping these women deal with really tough issues from sexual, physical, and emotional abuse to basic medical care. Naomi, with tears in her voice, describes the Mikvah as a way to help these women who seek solace in the Mikvah to ultimately find their own identity. She talks to us about the Eden Center as not only a Mikvah but more importantly with real purpose to provide training to the attendants (those that assist women who visit the Mikvah) as they deal with such sensitive subjects in such a complex political and social community. I believe we all gained a deeper understanding of the Mikvah and awareness of importance of The Eden Center for many women in Israel. We could hear the cry for help and see the disparity in their voices. We left with our own challenges. Not questions about challah-baking or candle-lighting, but rather how does this fit into our own way to make a difference? For the first time since 1988, I welcomed Shabbat at the Western Wall. But this time it was a bit different as we began at the egalitarian part, something that certainly wasn’t an option when I was a college student. It was quiet with just a few people there other than our group – still nice to see women and men together at this sacred place. We did walk over to the women’s side and each took our time to take in the sights and sounds of this sacred place. We had a lovely Shabbat dinner at our hotel and were joined by Rabbi Miri Gold and her husband David Leichman. Miri and David have been members of Kibbutz Gezer since 1977. Miri shared that not much thought was ever given to the division of labor at the kibbutz and that it was just as easy to work in the kitchen as it was to ride a tractor (except making oatmeal…that was David’s job!). So it was no surprise to the members of the kibbutz when she announced that she was going to Rabbinical school. Miri was the third woman to be ordained in Israel through Hebrew Union College in March of 1999. As a result, she was asked to be a plaintiff in a lawsuit against the Israeli government demanding they pay a portion of her salary, thereby recognizing non-Orthodox rabbis. It took 7 years, but that recognition was finally given. Interstingly, the salary was not paid by the Ministry of Religious Affairs, but rather the Ministry of Culture and Sport. Nonetheless, this was a historic precedent, and Miri became the first non-Orthodox rabbi to be recognized by the State of Israel – a step toward religious pluralism. As we continue our visits and meet with current and potential Grantee Partners, I think we will all remember Miri’s story and have an appreciation for her perserverance in bringing about this change. Indeed, this Shabbat was far different than when I was last here! Of our group of 14 travelers, I am the only participant who has not previously been to Israel. So, I was full of anticipation and adrenaline as we prepared for Shabbat. I’m not sure what I expected, but the Old City is much more beautiful in person than it is in pictures. On Friday evening, we stopped first at the egalitarian section of the Kotel. We then moved into the main plaza and maneuvered our way up to the women’s section of the Wall. After observing a private moment at the Wall, I stuck my teeny rolled up note into a crack amidst singing, dancing, and celebration by hundreds of women from around the world. It was almost surreal to see the moon rising over the Western Wall in Jerusalem on Shabbat! Shabbat morning was wonderfully quiet. After sleeping in and having a late breakfast, nine of us ventured out for a more formal tour of the Old City of Jerusalem withour amazing guide, Michal. We walked through the deserted Mamilla Mall and marveled at the numbered bricks, which show how the walls were rebuilt after being disassembled many years ago. After entering the Old City through the Jaffa Gate, we stopped at a beautiful quiet garden at the entrance to the Tower of David for an extended history lesson. We spent the rest of the morning walking around, entering in the bustling Christian Quarter and an extremely crowded Church of the Holy Sepulchre. Our official tour ended with a plentiful falafel and hummus lunch at Lina Restaurant (so yummy!). Spending my first Shabbat in Israel with my JWFA sisters has been so special and is an experience I won’t ever forget. Tonight we listened to Helen Gottstein, actress and educator, as she performed her Four Faces of Israel. Her performance was thought-provoking and educational. The one woman act portrayed four different women in Israel from an Ultra Orthodox Jew to an Arab school teacher and their individual conflicts and opinions on the Israeli/Arab conflicts regarding religion, being an Israeli, and human rights. The group enjoyed listening to these various voices on the complicated conflict regarding the “one state” vs. “two state” solution. After the show, we walked on a beautiful evening to dinner at Piccolino where we enjoyed debriefing on our day and of course eating delicious food. Founded in 1972, ACRI protects the balance between Jewish and Democratic civil rights and liberties in Israel and all areas under Israeli control regardless of ethnic, religious, political, economic, sexual, or gender background. ACRI is based on the American ACLU model. ACRI works with the Knesset and only deals with principle issues. ACRI is involved with cradle-to-grave issues. The organization explores the systemic cause of communal problems and the erosion of civil rights in Israeli society, which has shrinking Democratic spaces. Economic inequalities are seriously impacting individuals/families on the margins of society. This morning we met with Dr. Susan Weiss, the founder of the Center for Women’s Justice. I found her to be such an inspiration for her pioneering effort to end the problems of agunot – woman who are “chained to their husbands” who refuse to grant them a Get. In the U.S., Susan was an anti-trust attorney working for the Federal Trade Commission. When she made Aliyah, she decided to work in the non-profit world for women’s causes in Israel. Long and impressive story made short, she has founded the CWJ, an organization our Jewish Women’s Fund of Atlanta has funded for the last three years. I think the entire group was so happy to hear the progress and support we have provided Jewish women who are being denied human rights of freedom by not allowing women to receive a divorce without their husband agreeing to it. Our grants helped trained lawyers and the Jewish women working to find a way out of abusive marriages. Our support also helped them engage with a communications/PR firm this year so more women will be educated and know where to look for help. The many civil court cases they have won and continue to win set precedents that allow for change. Meeting in person with this organization affirmed for me the good use of our funds. We were thrilled to spend our afternoon with the women and girls from Project Talya, an intensive 5-year course of study that operates through the Society for Advancement of Education in partnership with the Jerusalem College of Technology. The academically-gifted participants, who are typically highly religious and may not otherwise have the opportunity to reach their potential, earn both a high school diploma and a B.S., typically in computer science. First, we heard from the principal and the development director, who patiently answered a multitude of questions. We then spoke with a former student who graduated in the first Talya class nine years ago. This amazing woman is 22 years old and is in her second year of a PhD program in neuroscience. Wow! Finally, we moved to a classroom where we had three “speed dating groups” that each met in three sessions with a total of ten current students. The girls were poised, funny, and refreshingly honest about finding a school that offered them a sisterhood, where they are with students with whom they share common interests and where they were academically challenged for the first time in their lives. It was inspiring to hear directly from the girls about why they chose to attend Talya and what the program is doing for them. One of the girls in my last group summed it up the best…she said she was hesitant to attend Talya because she enjoyed hanging out with her friends and having a lot of free time. But, she came to Talya because she realized that, “if you have a talent, you should use it.” I loved that the girls in the program recognize their gifts and aren’t afraid to push themselves as far as they can. Meeting girls who are personally impacted by our grant has definitely been a highlight of our trip so far! After a bumpy drive on roads not equipped for tour buses, we arrived in Ein Karem, an ancient village very close to Hadassah Hospital. We were arriving to experience Kurdish cooking in a private home. Like most of our visits, we were exposed to history, culture, and family stories. We were not just greeted by an ordinary speech or handshake. We were greeted by a loud and very large dog, whose name we later learned is Tony. Tony was competing with the Kurdish music, clapping, and dancing that immediately engaged our group. We knew we were about to have fun, eat well, and experience something that most visitors to Israel don’t get to do. The sharing of culture and family rituals: Our hostess was so proud that the recipes she shared had been passed down from generation to generation, and from country to country. She wasn’t just cooking; she was honoring the women who came before her and fulfilling her obligation to keep their rich culture alive. Networks: Our hostess participates in a program called “Women and Tales in Jerusalem,” with helps local women start their own businesses. She meets monthly to network with women from other cultures to see how they can promote their interests and their respective cultures while running a business out of their homes. Food: We learned to make (sort of) and eat (definitely) kibbeh. Kibbeh is considered the national dish of many Middle Eastern countries. Needless to say, each culture has its subtly different versions, and I am guessing it is hard to pin down an exact recipe. While I am tempted to try to make this, I know I cannot recreate the warmth and magic that we experienced in Ein Karem. Alma is a pre-army preparatory academy for girls to provide leadership and learning opportunities and to close the social/economic gap for marginalized girls. It prepares girls to enter the IDF in officer tracks, which are much more prestigious than their original assignments. Alma is in the process of relocating to Jerusalem. This will allow the program to expand beyond the mechina and become a communal center for all girls and women in the neighborhood. We heard from one former and two current participants, who shared with us their incredible stories and opened their hearts to us about their experiences with Alma. WOW! That’s the best word I can think of to start this post about Women’s Spirit, because the work they do is amazing. They have programs to provide women survivors of emotional, economic and physical abuse with job skills and mentors to empower them to change their situations. We heard from a woman named Sabina, whose ex-husband left her with two million shekels worth of debt – outrageous! Sabina came to Woman’s Spirit and for the first time felt heard and understood. She committed to participating in the program and went through training to become an ambulance driver for MDA, earning her own salary and able to support herself. Women’s Spirit also has a program called Breaking the Binds, which focuses on regulation and legislation to create social change. They are in the process of lobbying the Knesset to change child support laws so that those payments are not taxed. Banks now freeze debts while women are living in shelters. Security guards accompany women to court because they are afraid of abusers. And a woman must have a court date within 60 days when a debt claim is filed against her. These are a few examples of steps taken to help empower these women. Women’s Spirit has a boutique of designer wedding dresses that are donated to them. Brides from all over Israel shop at the boutique both because the dresses are priced extremely well, and also because the proceeds support women. How amazing that Women’s Spirit has found a way to be entrepreneurial while helping these survivors. We all felt so proud to be partners with this incredible NGO and to see the impact of our grants! From the offices of Women’s Spirit heading to the Tel Aviv Hilton, we stopped by the Achoti Fair Trade store. Achoti (sister) is a feminist organization active in Israel to promote the status, culture and visibility of marginalized women throughout the country. JWFA is helping to fund one of their programs – Ehete – a resource incubator for economic initiatives for Ethiopian Women who live in Kiryat Gat, located in the middle of nowhere, halfway between Tel Aviv and Beersheba. Ehete builds on the already existing skills of Ethiopian women to create high levels of crafts, pottery, weaving and other products for sale so the women can earn a decent living and achieve economic independence. Achoti assists the women not only with the production of crafts for sale but also training in business, marketing and finance. This stop was like winning the trifecta – we could actually see some of the products that the Ethiopian women in Ehete create, we could see the breadth of other Achoti sponsored small business programs around Israel……and we could support our grantee partners (and the Israeli economy) through some old fashioned shopping! We oohed and aahed over clay menorahs, woven trivets and baskets, embroidered challah covers, pottery and children’s toys and quite a few of these items will be crossing the Atlantic back home to Georgia for Trustee personal use and as gifts. (You’ll have to ask someone to describe the “love box” – a small clay item that discretely signals your partner as to whether you’re in an amorous mood!) We also learned that Achoti has applied to be recognized as an official member of the World Fair Trade Organization which will open many new markets to them; they are also about to publish a book about the Ethiopian Ehete program as well as working on an on line shopping presence. From legal advocacy for women seeking divorce, to a gifted program for religious girls to a pre-military academy for girls from the periphery of Israeli society to a comprehensive women’s center where our dollars support teaching financial literacy to Achoti where immigrant women can turn crafts into products into profits, we are continuing to deepen our understanding of needs for women and girls in Israel and some of the our amazing grantee partners who work every day to turn dreams into success. Talk about stars being in alignment – we had the opportunity to have dinner in Tel Aviv with Rabbi Jeremy Stern, Executive Director of one of our newest Atlanta grantee partners – Organization for the Resolution of Agunot (ORA) and a former ORA client who, with ORA’s help, was successful in getting a “get” after almost 10 years of effort. ORA’s mission is to eliminate abuse from the Jewish divorce process. Working within the parameters of Halaka (Jewish law) and civil law to advocate for the timely and unconditional issuance of a Jewish divorce – a get — ORA believes that the protracted refusal of a husband to issue a get is a form of domestic abuse that must never be tolerated. ORA combats this abuse through the promulgation of a standardized “pre-nup get agreement”, through educational initiatives to make prospective couples aware of the need for agunah-prevention and for specific agunah case advocacy. So what’s the pre-nup look like and how does it work? It’s important to ORA that the pre-nup not be part of a ketubah (marriage contract) but instead be a separate standardized legal document that creates an escalating financial support obligation from a husband to a wife in situations where the husband refuses to grant a Halakhic Jewish divorce. By being outside of religious law, it’s enforceable by the US and Canadian civil court systems. Remember it’s not a “penalty” (since to be a Halakhic Jewish divorce, the husband has to grant the divorce of his own free will); instead it’s a civil support arrangement (with escalating support obligations assessed daily) that often serves to induce recalcitrant husbands to finally grant his wife a Jewish divorce. Stern told us that in 100% of all cases, having this halakhically approved pre-nup has been upheld in civil courts across North America. Rabbi Stern has developed an education program – that will be introduced to Atlanta in 2017 – to reach the Orthodox community – high school students, singles, young couples, and long-time married couples to present the pre-nup as a natural part of the wedding process – the tag line is that the pre-nup really says, “I love you so much I never want to hurt you” and his efforts are gaining momentum. (He also conducts “post nup” gatherings for long-married couples to sign the “support” (pre-nup) agreement to show their ongoing commitment to “not hurt each other” and to be a role model for others in the community.) ORA achieved a major endorsement this past September when the Rabbinical Council of America adopted a resolution that requires each of its members to utilize a rabbinically-sanctioned prenuptial agreement in addition to ketubah. We learned of the heartbreaking case of Rabbi Stern’s client who is a religious Israeli married for over 20 years to a dual American-Israeli citizen. The marriage deteriorated and out of spite, the husband abandoned the marriage (and his four children!) and moved to the US. The Israeli Beth Din granted the divorce, but there was no mechanism to get it enforced in the US, so the client was for 8 years an “agunah” who was left in an uncertain status without any ability to move her life and her children’s life forward. If he was still in Israel, where a Beth Din decision is legally enforceable, the husband would have been jailed until the get was granted. Let’s make the story worse – the husband who fled to the US changed his name several times and moved around so he couldn’t be easily tracked down. ORA agreed to take on the case and actually was successful in tracking down the husband who was then living in a small town in the mid-west as a Life Coach (talk about ironic). Even after he was found out, he continued to refuse – purely out of spite – to issue the divorce mandated by the Beth Din in Israel. ORA began an advocacy campaign using social media and a protest rally to create such public shaming that finally he granted the divorce. But this took a total of 8 years for the wife to be free of her abusive ex-husband and be able to move forward and really rebuild her life. Rabbi Stern told us about his upcoming trip to Atlanta in mid-December where he will be talking to Young Israel, Beth Jacob and several schools. He hopes to leave Atlanta with a task force of trained volunteers to serve as local resource experts for questions and issues raised after the broader ORA presentation. He also mentioned that he is working on an additional grant proposal to submit to JWFA to expand the reach of ORA efforts to ensure that spousal abuse in the form of get refusal is not tolerated anywhere at anytime. Despite the late hour of the dinner, we all had a very animated conversation with Rabbi Stern and his client – how could these types of situations be tolerated? How could anyone not be willing to sign a halakhically approved pre-nup? How could a wife achieve her right to a divorce if she didn’t have the financial resources or personal stamina to continue to fight for her right to be independent? And on and on……. To be truthful, I think it’s a little hard for us 14 women from Atlanta, who are all strong women in our community, who can easily advocate on behalf of our needs and rights when required and many of who belong to more liberal strains of Judaism to fully appreciate what “get abuse” is all about – but hearing Rabbi Stern and hearing his client’s personal story showed us all a perspective that was eye-opening – that this aspect of halakhic law is in fact spousal abuse and just as we fight for victims of domestic violence, economic abuse, unequal access to rights and services, etc., we all need to see that fighting “get abuse” is right up there with other problems impacting the ability of many Jewish women to achieve the dignity and independence that we are all due. Mesila is a program that has spread through religious schools to teach girls and young women from middle school through seminary how to manage finances. We visited a 7th grade class where the girls spoke enthusiastically about how they use what they have learned, for example, the differences between using cash, checks and credit cards. In addition, they learn about budgeting, which helps them appreciate their parents’ challenges in regard to giving them what they need and not necessarily saying “yes” to things they want. The students are taught the value of saving which helps them make good choices when they consider buying things they want. They also learn the value of saving for the future. Social pressure is decreased because the girls are more mindful that everyone does not have the same financial resources. In addition, there are reports from the parents that the children are more respectful and appreciative. The teacher also said that in homes where the children participate in the program, their families learn to budget more carefully. Batya Weinberg, director of the Mesila program, shared that in the post-high school program the young women develop financial structure in their lives. The latter includes prioritizing, budgeting, properly communicating needs, etc. These skills carry over core values into all areas of their lives. We were told that the Mesila curriculum is also being used by Temima High School here in Atlanta. Perhaps we will visit a class there and hear from the girls how the course content impacts their lives. Iris Zilka and Efrat joined us for dinner at Decca restaurant representing Makkom, a project we have supported for one year. Iris began her career as a social worker who wanted to create social change for high-risk girls. She thought about what she could do to achieve this but felt trapped as did her clients by the lack of support from the government. Iris went to work as a researcher for JDC but she didn’t find this work fulfilling. Several years later, she was asked to develop a plan for Care Leavers who leave foster care or residential care at 18 and have no support or place to go as they have no family who can help them. Iris talked to girls and was convinced she could help them so in 4-6 weeks, she had written drafts, interviewed agencies, and gotten money from the government to obtain apartments for 6 young women. She realized she could not depend on this money long-term and soon she established Makkom in order to change the policy regarding Care Leavers. This was in 2012. She understood that the girls who were being served knew best what was needed to help them so she matched them with law students who are acquiring tools for social change which means changing legislation. Our group was shown a powerful video about Makkom that was on television in Israel. It highlighted a young woman who lived on a staircase for a year before Makkom found her an apartment. Efrat then spoke and told us that when she was 4, she was sent to foster homes where she was abused, went to 8 or 9 schools, and suffered from addictions and other serious problems. She had no place to go but still had plans and dreams for a better life. When she met Iris, when she was 21. Today she is a social guide for youth at risk and works for Iris. She meets with law students and teaches young girls, as she shows them good things can come from their negative experiences as they work to change legislation to get support for Care Leavers who are 18-25. All of these experiences have empowered her to show love and courage, and when she meets the young at-risk girls, she “opens her heart” to them. Makkon is creating social change using collaboration with the law students and the girls who have life experiences to support the work. It is empowering women to help others and has the potential of changing the lives of so many women. I was truly impressed with the presentation and their important work. We spent a morning with ‘Cracking the Glass Ceiling’ Program Directors, Principal, and students at the Alliance Israelite Universelle – KIAH (Kol Israel Haverim) School. Our visit gave us a glimpse of the programs’ general background and history, key issues, notable funding partners, fundamental approach, metrics, examples of change, plans for future growth, and best of all, a “Question & Answer” session with the students. The Program Director emphatically stated that Cracking the Glass Ceiling is a program that is “not like any other.” Cracking the Glass Ceiling, a STEM (science, technology, engineering, and mathematics) program for Jr. High and High School age female students, was recently initiated as a result of some key issues discussed among the educators and their major funding providers, including The Minister of Education. They realized that education in High-Tech fields were important, but that there weren’t any resources to implement programs. They needed to develop a new generation of teachers. They realized the focus for a new program needed to be not only on the students but on the teacher training. Create workshops, develop guidebooks, provide guidance, and identify firms to initiate mentoring programs for the girls. Open a cheerful, safe place for girls to live. Complete with books, and an XBOX! House the girls in the center during the school-week. Change the state of mind (look at how they are looking at math/science from gender point of view) of the students. Work with principals to help them evaluate metrics from from a gender point of view. Implement female mentoring programs ‘firms’, like Intel. Q – Why is Crack the Glass Ceiling Program important? It empowers them to think about themselves (other possibilities) and they realize they are not worse than boys. Q- How has the Crack the Glass Ceiling program contributed to (overall) school (success)? Q- Who was your role model before entering the program? Her mother was at home before the program, but now her mother works as a teacher. Both her mother and father work, and she understands how difficult it is to balance career and family life. Any woman that succeeds is her role model. Hillary Clinton is her role model. She says Hillary is a Bad- A**. We all laugh! Q- What was it like working with the Firms? They learned that the world wasn’t as equal as they thought it is. Worked with Intel on a simulator. Thought maybe she would be able to work there some day. Worked with a simulator that was for ‘combat airplanes’, and it opened her eyes up that maybe she could be a combat pilot. One girl stated she might want to major in Behavioral Economics or (Applied) Physics. Some of the projects the girls worked on with the companies, included website development with Sandisk. They completed the website in 1 ½ weeks. The school met us with open arms and was eager share their accomplishments with us. I believe our experience during the visit was a reflection of the ‘open dialogue’ and cultural attitude of the school and its staff. Undoubtedly, we all walked away feeling good about our commitment to such a wonderful program, and could ask ourselves: where to go next with all that was learned from this experience? Many (not all) of the Grantee Partners we have visited this week have been striving to make social change from the bottom up by working with girls and women to enrich their lives, improve their opportunities, and empower them. WePower is working from the top down “promoting women’s leadership, gender integration and equality at all levels of Israeli society.” How?? The project JWFA has been supporting trains and encourages women to be decision-makers….to participate at all levels of local, regional and national politics as elected officials. In those roles, women are able not only bring a gender lens to issues, but are able to help define issues. We shared lunch with Michal Yudin, the Founder and Chair of WePower. When she began this work in 2000, women held only 9 of 120 seats in the Knesset. Today, there are 33 women serving. A decided improvement though well short of the goal of 50%! However, her feeling is that it is even more important for women to be mayors and council members, where they can wield influence on the local level. Michal spends time in the US and we would love to have her meet with all of our Trustees! After lunch (another delicious and probably unnecessary meal!) we heard from Liel Evan-Zohar. She is currently the ED of WePower, after holding council positions and completing an unsuccessful run for a mayoral seat. She shared disappointing data about women in governmental roles and a bit more encouraging data about the public sector. The unique programs that WePower offers…teaching women to speak about gender, speak about leadership and work with programs on the periphery of society…have been successful. Thus far 37% of the graduates have run for office. There is much more work to be done to achieve the WePower goal of gender equality in Israel by 2030! JWFA certainly has a role to play in that effort. Latet Atid helps women living on the edge of poverty build or expand a business. They receive training and education about running a business, such as advertising, marketing, and finance training. Most impressive is the mentor program that give that extra special attention to each recipient to help them succeed. Once the women have a business plan, Latet Atid helps them get a micro-loan, either from a pre-arranged bank or a private fund. Since 2014, 750 women have received loans. The hope is that the total household income will increase after three years and that all loans will be repaid within three years. We were very impressed that 90% of the donations to the program are made by Israelis (which is very rare). We met with two of the women in the program. One owns a unisex hair salon, and the other has an event planning business. Both have achieved success in a short period of time. We also met their incredible mentor, who volunteers her time, along with 16,000 other volunteers.